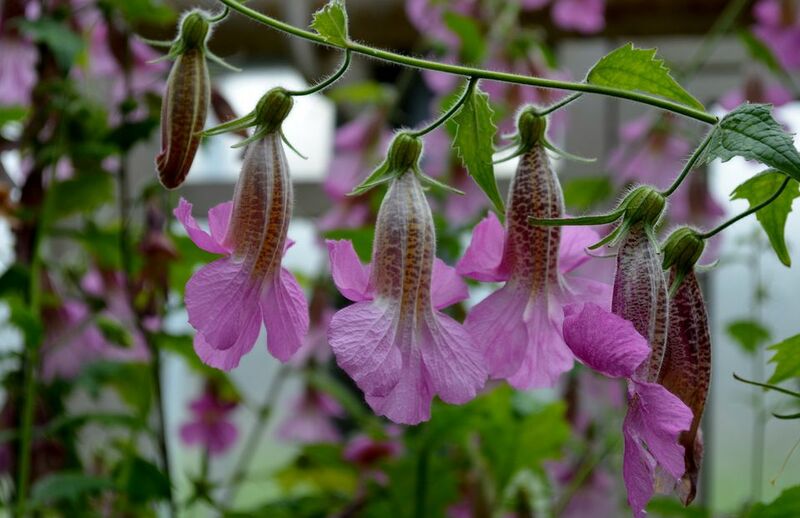 The common name of perennial flower Rehmannia is Chinese Foxgloves because the tubular flowers bear a resemblance to Digitalis. Spikes of dangling, bell-shaped, rose-pink blossoms poke up from scalloped, glossy green leaves. Unlike traditional foxgloves, Chinese foxglove petals of the bell lip flare open and outward. The prolific blooms are long-lasting and will repeat bloom for 3 to 4 months, unlike traditional foxgloves. Spring planted seeds will generally not bloom the first year. To get around this frustration, you can plant the seed in the fall, for flowers the following summer. Although Chinese foxgloves are not as hardy as digitalis, they are more versatile, growing well in shade and even dry shade. Chinese foxgloves are only hardy in USDA Hardiness Zones 7 - 11. They cannot handle freezing temperatures and should be given some protection, like a thick layer of mulch, during cold winters. In areas colder than zone 7, you can try starting over-wintering plants indoors or grow your Chinese foxgloves in containers and move the containers to a sheltered and protected spot for winter. Make sure the containers get periodic water and allow it to drain. Lifting the container off the ground with a couple of bricks will ensure the drainage holes are not blocked by frozen ground. You can grow Chinese foxgloves in full sun to partial shade. They will still flower quite well in shade and can even handle dry shade. In full sun, they will need extra water during hot spells. Unlike digitalis foxgloves, Chinese foxgloves repeat bloom from spring through fall. You really get your money's worth. Chinese foxgloves help to light up shade gardens and that is where they grow happiest. They begin blooming as spring woodland flowers fade. They provide a nice accent to Hosta and the glossy leaves and nodding blossoms contrast well with Astilbe. Chinese foxglove also grows happily in containers, if given regular feedings to encourage blooms. Soil: Chinese foxgloves are not particular about soil pH, although they do best in a neutral pH of about 6.5 to 7.0. However, they do need well-draining soil. The root will rot in soil that remains wet for extended periods. Poorly draining soil can also cause problems during the colder winter months. Once established, Chinese foxgloves have good drought tolerance, but keep them well watered in their first year. They grow best in light shade but can handle full sun if there is sufficient water. They are more drought tolerant in the shade. Maintenance: Chinese foxgloves are fairly low maintenance. Plants should be deadheaded for continual bloom. A side dressing with compost or monthly feedings will also help promote flowering. You can divide your plants in the spring, but since they spread so readily, you probably won't need to. You'll have plenty of plants and if some die out, new ones fill in. Problems and pests: Although Chinese foxgloves are generally pest free, slugs and snails may munch on its leaves. It can become invasive in certain areas, particularly when grown in moist, rich soil. If your plant starts to become aggressive, cut back on either food or water, to stress the plants and slow their growth.